As the Mamamikes blog updates, the amount is exceeding $1900. May i reiterate the thanks to the following people…. Thank you to the following Kenyan Bloggers for committing their time to volunteer on the 17th. 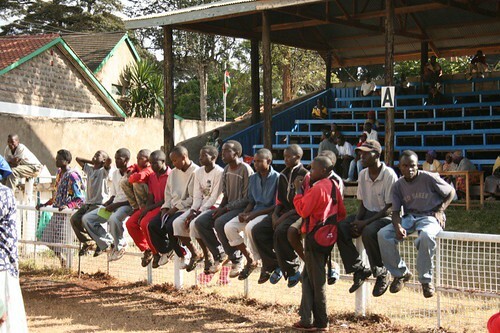 Bloggers for Kenya, and Hope in Jamhuri Park. For your $10 voucher a package with the following items is purchased for the Red Cross. Vouchers are available in the amounts of $15, $20, $25, $50, $75, and you can buy as many as you are able to. This week we would like to appeal to all bloggers, friends of bloggers, wannabe bloggers, diaspora kenyans, Tedsters, treehuggers, geeks, nerds, boingboingers, worldchangers…you get the idea, to give what they can using Mamamikes’ donation page. 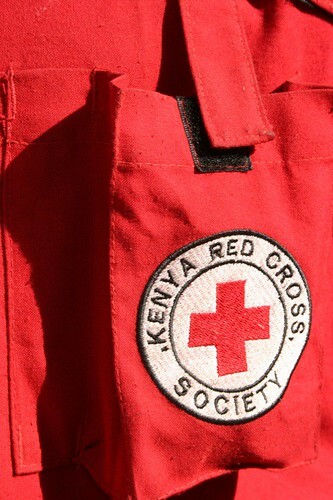 On Thursday the 17th of January the bloggers in Nairobi will meet at the mamamikes office, assist in purchasing all the items and delivering them to the Red Cross. Parliament opens tomorrow and there are some rallies planned later in the week, therefore depending on the situation, we will still shoot for Thursday to deliver the items to Red Cross. If for one reason or another the situation is too unstable on Thursday, we will reschedule and let you know. For now, please post about this and tag your posts with ‘Bloggers for Kenya’. 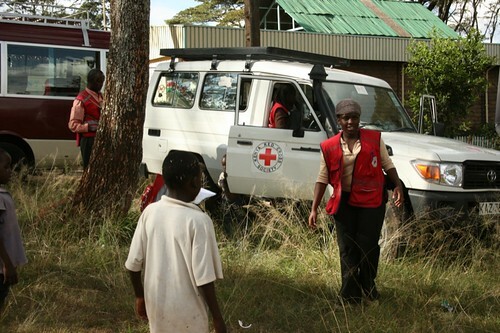 With all the feelings of helplessness many feel at the current situation; what with failed mediation attempts, fears of more instability as Parliament opens tomorrow, the secondary trauma of watching news of your country being torn apart; perhaps the only thing that can keep Kenyans (here and in the diaspora) sane is doing something to assist the displaced. I have since learned the acronym IDP (Internally Displaced Person), something that aid workers such as Mr. Arunga who works in Darfur, and diplomats in Africa are familiar with…Now the acronym is being used to describe the people camped in various shelters in Kenya. 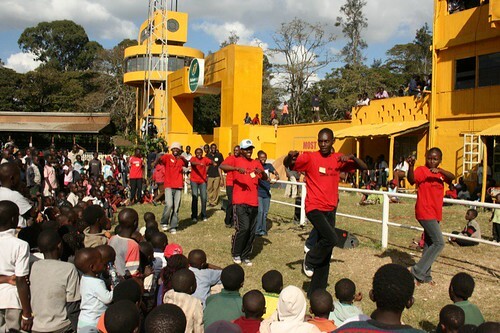 One such place is Jamhuri Park, Nairobi. I joined Martin and Cynthia of Mamamikes on a visit to Jamhuri Park to see first hand the plight of Internally Displaced persons. It was heart-rending, and very surreal. We could not believe that this was happening in our country, but left with a bit of hope in our hearts as we saw the work of other volunteers, the Red Cross, St. John’s Ambulance Service and even the police/military. Martin and Cynthia have written about the experience here. I will only add some pictures from our day, as they have wonderfully captured everything i wanted to mention in the post. Thank you! Ahmed’s red cross Jacket. 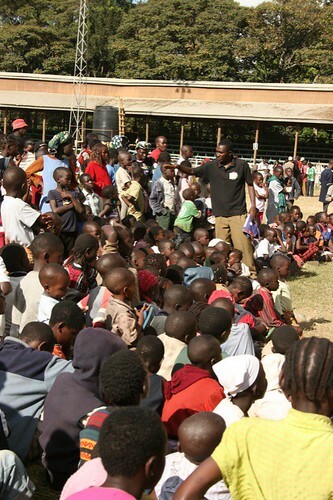 He usually works in Isiolo, but came to Jamhuri Park to help with the tracing activities. I.e figuring out who are the lost children, photographing them, and tracing their relatives. 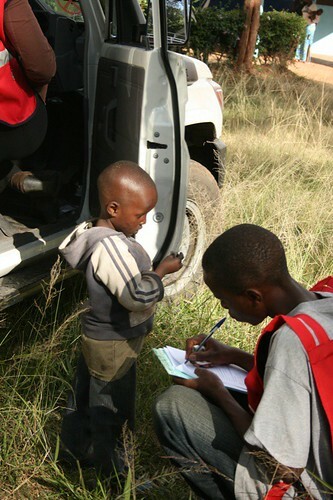 Kevin (the little boy) talks to Victone of the Red Cross,who is part of the tracing team that will try to locate and reunite Kevin with his family. Children gathered for a bit of entertainment in the afternoon. The whole set of photos from the day is here. 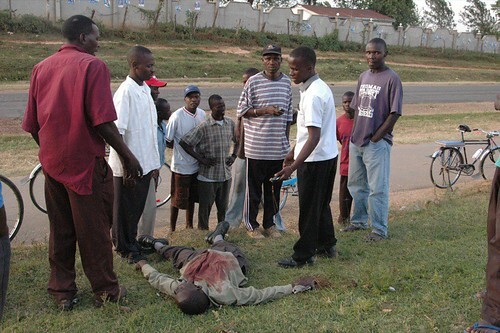 The Death of James Odhiambo – Kenya Post Election violence. Note: Images posted on www.Ushahidi.com. Disclaimer: The following images are gruesome and disturbing. The humanitarian crisis is real and dire. Complete set of photos taken in Kakamega by Mr. Arunga are available here. 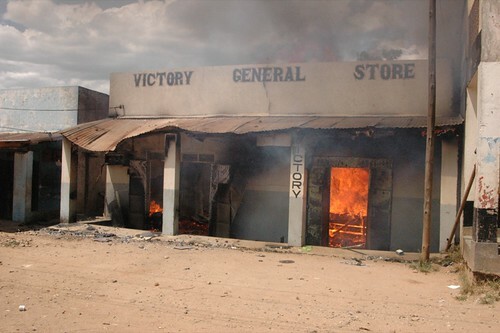 The images include shots of the police station, showing the displaced taking refuge there, burning shops, vandalized petrol station and burned car. Onlookers and concerned citizens around the body of 24 yr old James Odhiambo, who was killed in the post election violence in Lurambi – Junction on the way to Shikoti, Kakamega, western province, Kenya. The gentleman in white (Brian) on the right worked with James at the petrol station as attendants and witnessed the shooting. 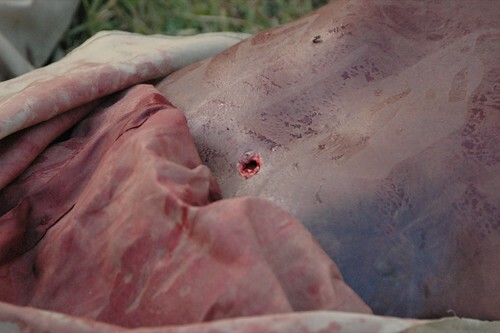 Close up of the bullet wound on the body of 24 yr old James Odhiambo. According to eye witnesses, he was walking to work when he met the GSU paramilitary. Mr. Odhiambo continued to walking towards towards the GSU as he thought he could talk to them and find out what is happening. According to eyewitnesses, he was shot without even though he was not violent or doing anything that would indicate he would be a threat to the GSU. The witnesses tried to contact the police so they could come and pick up the body, but the police said that they did not have fuel for the vehicle. As of the writing of this post, the late James Odhiambo was buried yesterday in Homa Bay, Nyanza province. Brian and other friends from the area traveled to Homa Bay to comfort the family. If you would like to help the family directly, please do not hesitate to contact Brian Oluoch at +254 724 912015. 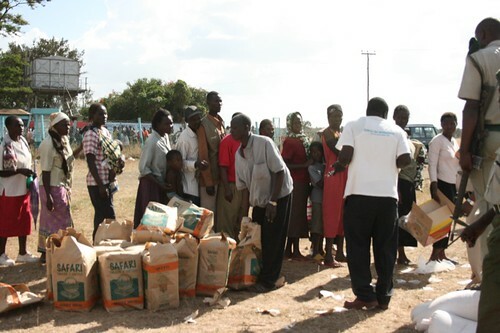 Mr. Odhiambo was the sole breadwinner for his family…Any contributions towards their well being is appreciated. Pictures were taken by Mr.Michael Arunga, who works for World Vision in Darfur, and was on holiday at the time. He witnessed the burning of a kikuyu owned property, as shown in this photo. **The decision to post the pictures here and to tell this story is partly because the pictures were sent to editors of newspapers in Kenya, they did not run them or cover the story. As people try to get back to ‘normal’ life around the country, it is important to remember that there is no normal for a lot of people in Kenya. Note: Global Voices Online has a special coverage page that aggregrates posts relating to the post election aftermath, based on Hash’s list of blogs. 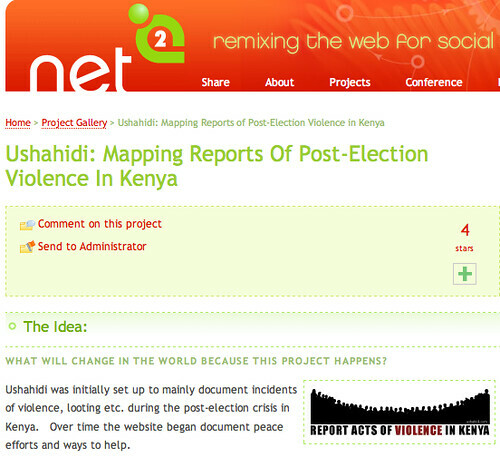 Upload pictures, video and report incidents of violence in Kenya. sms your incident to +44 762 480 2635 once a local number in Kenya is set up we will be sure to update you. 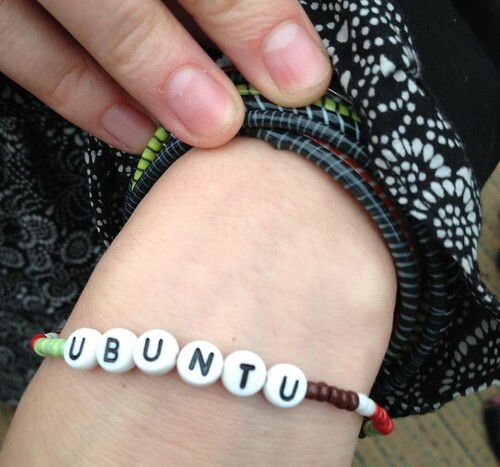 The blog Sukuma Kenya has a paypal donate button. Mama mikes is working on a donation page where you will be able to donate specific packages to the red cross. Once its live i will be sure to update you. You can still send credit and other forms of assistance to family members at any time. Update: 5:45 pm Nairobi Time. The Mamamikes crew are working to catch up with the orders placed, some of them were stuck in various parts of the country and just made it back yesterday. 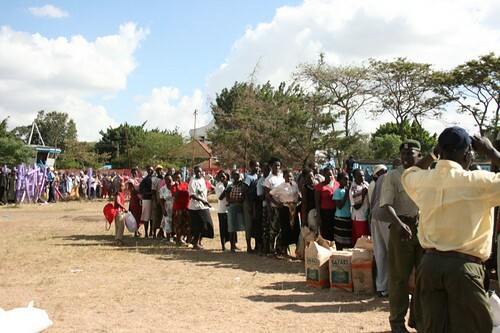 Most of the orders to Eldoret and various parts of the country are being processed now. Thanks. I left Eldoret yesterday, with a heavy and broken heart. As much as i wanted to stay and write about what was going on there, i needed to get back to Nairobi and get back to work on my Global Voices gig. 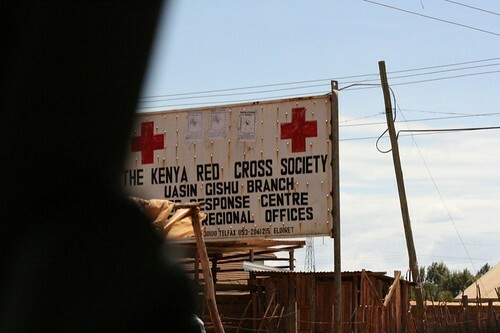 First, this is the link to Kenya Red Cross and you can donate here. I kept snapping pictures on my way out. 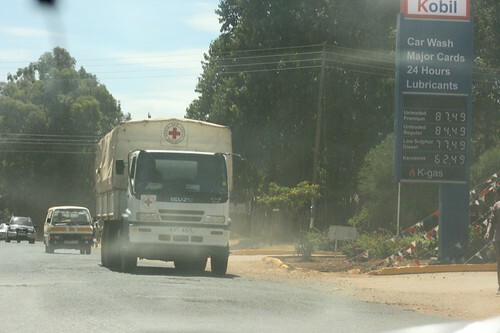 This is of a Red Cross Truck heading into town, as we were leaving towards the airport. This was a good sign and a ray of hope. The Kobil on the right only had diesel available, no petrol, same case with National Oil, just a few miles ahead. The airport is operational. 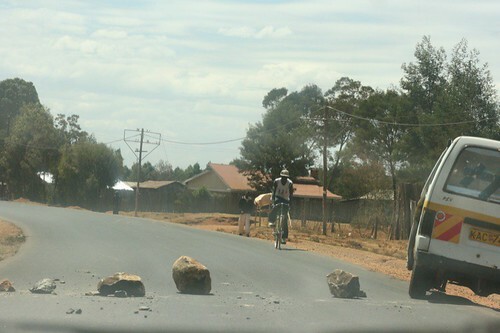 Saw remnants of a roadblock on the way. From a chat with the former Councilor of Eldoret: There were attempts by religious leaders to convene a peace meeting yesterday, but this did not happen. The hurt and divide inflicted by events of the past several days may be too great to bridge over. It will take time and a concerted effort. I had ordered some credit using mamamikes on the 1st of January, but still haven’t received it as of today. Like KP said, Safaricom and Celltel need to enable online recharge of airtime so that the diaspora and even Kenyans in Nairobi can purchase airtime for others. My aunt who uses MPESA said it was a godsend and will always keep money for emergencies. This is because MPESA can be used to send airtime/money to yourself and others. 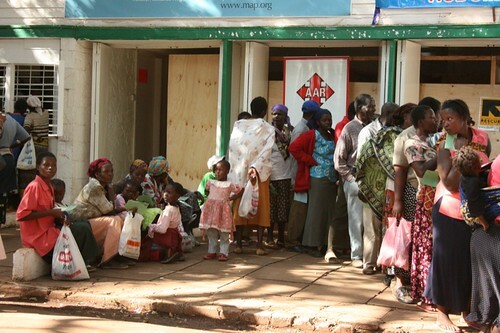 Because of the hurdles encountered using either MPESA (their offices were closed) and Mamamikes, i would suggest that if you would like to Sambaza credit and have an immediate impact, you can send it to The Chairman of Kenya Red Cross Eldoret – Advocate Birech 0722 82 8484, who will distribute it to those affected and aid in the Kenya Red Cross effort in Eldoret. For international readers and diaspora, the link for donations to Red Cross should work, though will update you with more information as it becomes available. Anyone with other avenues of assisting is welcome to comment. Thank you. Most of you in the blogosphere have heard how bad things are. If not, click here to see a video of what Mr. Mugabe’s govt is doing. Our African leaders failed to persuade Mugabe to stop the madness, meanwhile Zimbabweans continue to suffer. This picture which appeared on the mg.za photo widget caught my eye. It captures a bit of that exasperation and imminent danger to those in Zim. This young man joined Zimbabwe’s National Youth Service in late 2005 and has related to the M&G stomach-turning details of secret prisons and torture camps. He has now been moved to an unknown location in Europe and continues to fear for his life and for the lives of his remaining relatives in Zimbabwe. Read the full story about the above picture here (Title – “I was in a Zimbabwe Death Squad”). Please visit a fellow blogger Sokwanele for more information and info on how you can help. Thanks.